I just realize how much I admire people who provide the very best care for their special-needs dogs. Imagine how hard it is to deal with a puppy or dog who doesn't like to drink their medicine. Owners have to devise ingenious ways in order for these dogs to take it in. Deworming China is effortless. He just loves seeing Albendazole Microzole's blue color being fed to him. I am blessed to have pups that are quite cooperative when it comes to drinking vitamins and deworming medicine just like their mom. 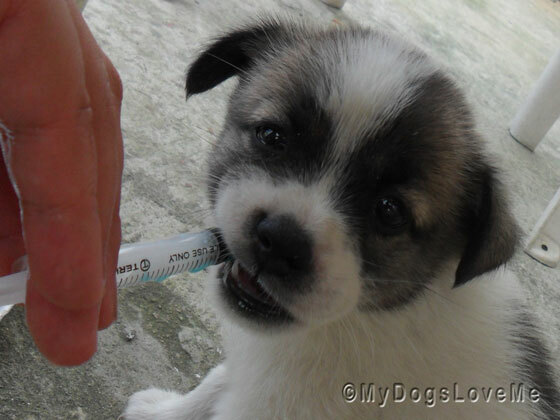 Not only does PJ, Chooey's first born Shih Tzu mix, enjoy drinking from the syringe, but he expects to be given more. I guess Microzole (the dewormer I am using) does "taste" good. Having problems with giving your dogs medicine? Here are some techniques you should try. 1. Putting the liquid solution in a syringe and injecting it inside the pocket of your dog's mouth slowly. 2. Slathering it with peanut butter or cheese spread to conceal the medicine's scent from your dog. 3. Putting it inside his food or doggy treat (*cough* hotdog) or sprinkling the crushed contents in your dog's food. Deworming your pup or dog is very important. The first time I had Peanuts, I was really surprised how many canine worms she had. I can still recall how those little white things wriggled their way out. 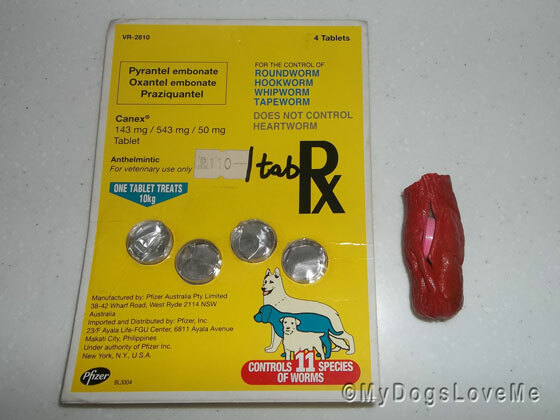 We're (Bella and I, Daisy) lucky that we like our chewable worm tablets. Roxy has to have hers disguised or poked down her throat. Tablet time is always tricky but peanut butter and jam helps. Have a serene Sunday. Our worm tablets are chocolate... yum! 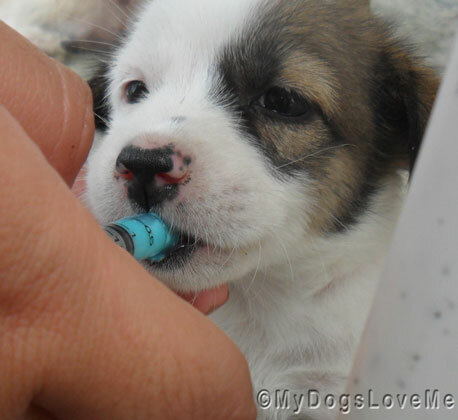 We don't think anypup likes to drink their medicine - thank dogness for syringes! Indy's many meds are hidden in a small wad of cream cheese. He loves it! I have a cat on antibiotics right now (his sister nailed him in the face and it got infected). I totally prefer the liquid, just squirt it quick in your done - especially with cats who are smart enough not to eat any tainted food. With the dogs I just hide the meds in cheese and voila, they eat it. So far we eat ours! I don't like tablets but Cody eats them like treats. Jen has tried all of the above! The trick is to mask the scent as much as possible. If the dogs have good experiences as puppies with medicines, it makes it so much easier when they are grown. The same with people giving the medicines, practice makes purrfect. Our daughter had a day care provider who got her first dog. When it came time to pill the puppy, she couldn't do it. Our mom gave the puppy its medicines when she dropped off and picked up her daughter. We like to take our medicine, especially if it is tucked inside a hotdog or cheese! Good advice. Getting pups to take some medicines is not always easy. The WDA are experts at eating the hotdog or treat then spitting out the pills but fortunately when dad slips it into the chucky stew pieces in wet food, especially the venison, we have no troubles. Some of our meds get crushed and mixed with dinner. You asked about Eskies and Poodle sizes. Daisy and Maple are standard size poodles who each weigh about 68lbs (and they are both considered thin). and stand nearly dinner table height at their shoulders. YoYoMa, our biggest standard size American Eskimo is 36 lbs. and is about 23" at the shoulder; Siku is 19lbs and 18" tall. Oso is a toy at 14 lbs. and is probably the height of Chooey. I wondered how mom got those medicines in me without me looking. Oh I remember using these when Zoe was a puppy. It's so much easier now with the chewable tablets. My dogs are fans of peanut butter, square cheese and baloney for hiding meds. I'm glad they don't have to take them often, since they figure it out pretty quickly. We sent you a Valentine's Day card to the address that was on our Christmas card. I hope that is still your address! If not, I guess it's the thought that counts! The puppies are so cute! Hi! How much did you spend on those deworming tablets?